Top representatives of the German auto industry (Dieter Zetsche, head of Daimler, Herbert Diess, chief executive of Volkswagen, and Harald Krüger, BMW’s chief) have all shown cautious optimism after a meeting with US President Donald Trump that the tariff threat on their exports to the US can be averted. In return, they have promised to increase investment in US production facilities. "I think we've taken a big step forward to avoid tariffs," said Volkswagen chief Mr Herbert Diess on after a meeting with President Trump in Washington. Daimler CEO Dieter Zetsche also claimed that the talks had reduced the "potential threat" of new US import tariffs. At the White House meetings with Trump and other government officials, the managers said they discussed past and potential future investment by their companies in US locations and production. 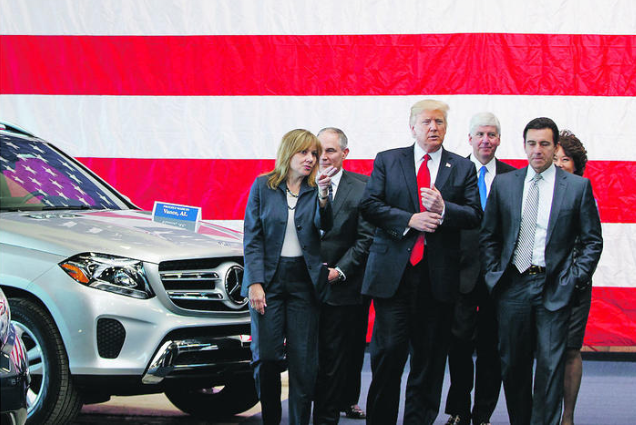 However, it remains unclear whether the punitive tariffs threatened by Trump on European car imports of up to 25 percent can actually be prevented. Trump had sent out a sharp message shortly before the meeting: "I'm a tariff man," he wrote on Twitter. If other countries wanted to "plunder the great wealth of our nation," he would make sure they pay for it. Originally only meetings of the car manufacturers with Commerce Minister Wilbur Ross, the Trade Commissioner Robert Lighthizer and Trump's business advisor Larry Kudlow had been scheduled. President Trump joined in after a brief announcement. Above all, it was Trump's demand that the German corporations would expand their production facilities within the USA. Mercedes had begun a project for a battery factory near its car production facility in Tuscaloosa, Alabama, in October. Meanwhile, Volkswagen said it planned cooperation with Ford for the construction of pickup trucks. BMW's said it would invest $ 600 million in its world's largest manufacturing facility in Spartanburg, South Carolina. That would create another 1,000 jobs there. The company said it is also exploring the development of another US manufacturing facility. The visit of the German car manufacturing CEOs was controversial in Germany and the EU, as the corporations are normally not authorized to negotiate trade policy directly. Mr Diess and Mr Zetsche emphasized, however, that their visit to the White House had been closely coordinated with the German Federal Government.